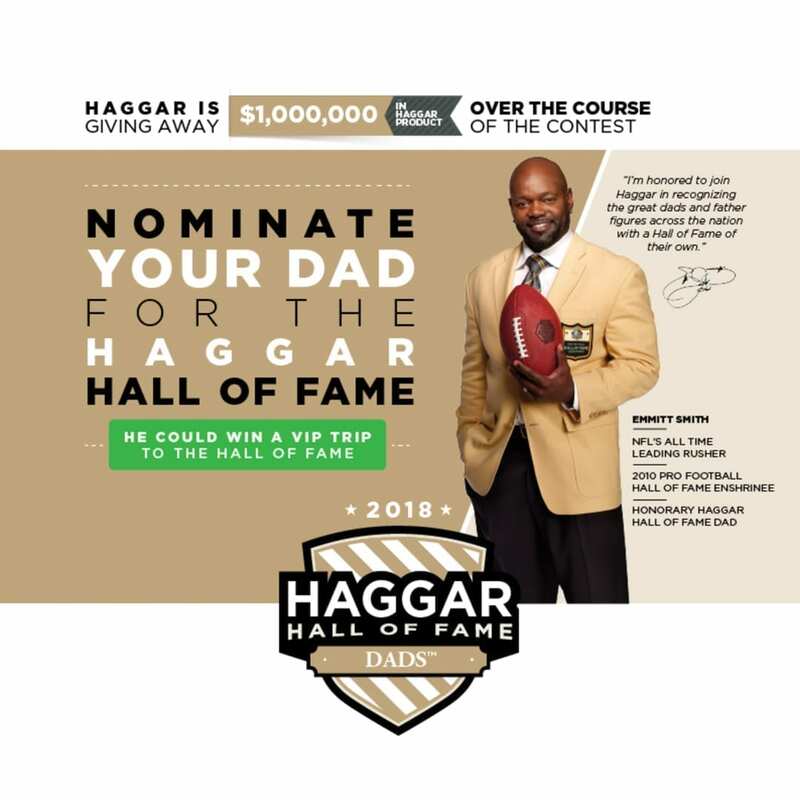 Emmitt Smith, who is the NFL’s all-time leading rusher, has partnered with Haggar clothing line to give away over $1,000,000 worth of products to the nation’s most deserving fathers and father figures. As the maker and provider of the exemplary jackets for the Pro Football Hall of Fame, Hockey Hall of Fame, and Naismith Memorial Basketball Hall of Fame, we know that all champions wear Haggar. Dads and father figures are winners as well. So, we want to recognize them with the Haggar Hall of Fame Dad™ awards. The sweepstakes are open to residents of the United States, DC, and Puerto Rico. One entry per person. More than one individual from the same family may enter the same nominee. Submit a photo with a caption, slideshow video with a caption, or video that is no longer than three minutes of your living father or father figure that features why the nominee is worthy of the Hall of Fame. Qualities must demonstrate attributes such as community support, family leadership, and praiseworthy character. The public will vote on your entry in phase one to determine up to 52 finalists that will advance to phase two. Public voting for phase one must follow the same guidelines as those for the judges. One vote per person for each entry. However, you can vote for multiple entries. The foundation for criteria will be on a 100% scale. The number of votes received from the public during phase one will make up 40%. The strength of the compliance to the overall contest theme will equal to 30%. The quality of the entry and the ability to raise the judges’ emotion determines the last 30%. First 5,000 Entries: The first 5,000 entries will receive a Haggar pair of pants. Phase One 52 Finalist: The 52 finalists, as determined by the public votes from phase one, will win a Haggar Blazer with a custom Hall of Fame Dad patch, a J.M. Haggar Suit, and two pairs of Haggar Pants, in addition to a football autographed by Emmitt Smith and $1000. A trip for two to the 2018 Pro Football Hall of Fame Enshrinement Ceremony held in Canton, Ohio. This prize includes a four-night (double bed) hotel accommodation with round-trip air transportation from a major airport local to the winner, tickets to the events, and $1000 toward travel expenses. A trip to the Naismith Memorial Basketball Hall of Fame Enshrinement Ceremony held in Springfield, Massachusetts. Prize includes a two-night stay at a hotel as well as all the same conditions listed for prize A. $5,000 substituting the travel prizes. If you have an honorable father figure in our life, recognize them by a nomination into the Haggar Hall of Fame Dad™ awards. Are you planning a sweepstakes or skills contest? Contact CFA for all your contest management service needs.